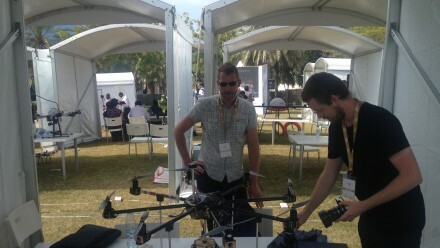 We participated in the first UAE Drones for Good Award with the Archeodrone concept. ART+COM Studios developed the idea for the drone’s cultural use together with the Danish media company Redia. Although we were not among the lucky winners in the end, we believe that the Archeodrone is a great tool for immediate visitor experience of an archaeological site. In the below interview, Jussi Ängeslevä speaks about the device’s application for spatial communication and what needs to be considered when putting it to use. The employment of drones in archaeology is an established practice. Drones provide an overview of a site in a hard-to-get-to area with preconfigured flight paths and image capture. They help in seeing ‘the bigger picture’. Cultural centres at archaeological sites present their heritage to the general public. It’s common practice to show visualisations of the site as part of the exhibition, although the original subject is right next door. 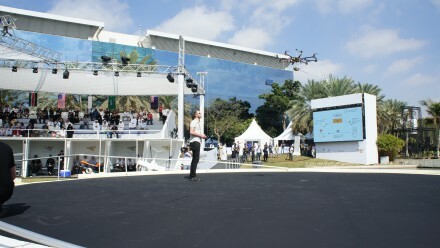 The Archeodrone connects indoor and outdoor through a live video recorded in real-time by cameras mounted onto a flying drone and displaying the video inside the museum. The drone flies a predefined flight path, ‘a scenic tour’, around the site and captures a spherical video of the flight. The drone is fully autonomous, but the museum visitor can choose which way to look freely, being the ‘second pilot’ of the flight (just like in any professional drone camera team, where a pilot flies and a camera man manoeuvres the camera). Six GoPro cameras are mounted onto a custom built octocopter, and custom software stitches the camera views to a single ultra high definition spherical video. Audience in the visitor centre can operate the camera view and see the flight on a big screen. All the flown flights’ recordings are added to a database, which slowly grows to cover all weather conditions and seasons. Navigating through this spatial and temporal capture non-expert audiences can experience the archaeological site in an exciting and immersive way. The Archeodrone uses a tool common in archaeology — the drone — as a communication vehicle and gives a sense of authenticity and empowerment to the audience. It can inspire younger generations to engage with history, helps communicate the changing conditions of the sites and could become a platform for interactive drones in exhibition use beyond archaeology. Susanne: How did the project come about? Jussi: We were working on an exhibition project for a museum at an archaeological site and wanted to communicate the authenticity of the place — something that you cannot experience when you are at home, browsing the web. We wanted to provide a bird’s view of the archaeological site to make visitors understand what the place is like. So we developed the idea to use the drone, which is a professional archaeological tool, for spatial communication. Redia had been working on their octocopter drone for a while — so it was really out of this collaboration and common interest that we developed the concept for the Archeodrone together. Susanne: Why is this project particularly interesting for ART+COM Studios? Jussi: ART+COM creates new forms of communication using modern technology. The drone is such a piece of technology, a high tech gadget, which we use and make accessible to ordinary people. You don’t need to be an expert drone pilot to use it, because we make it accessible to you — and we tell a story with it. Susanne: What is the most challenging part in the project? Jussi: The laws of nature: when you do something outdoors, wind, rain, snow, and all these kind of things have a big effect. We cannot control the space like we normally can when working for indoors. The second challenge is legal issues. In order to get permission for flying a drone in populated areas you must have a safe, redundant system, so that the drone cannot suddenly break, crash and plunge on somebody or something. A drone still weights a couple of kilos. That could be dangerous. Our solution to this is that the drone does not always have to fly. In bad weather conditions or after sunset you cannot fly the drone, but you can still look at the previously recorded flight videos. 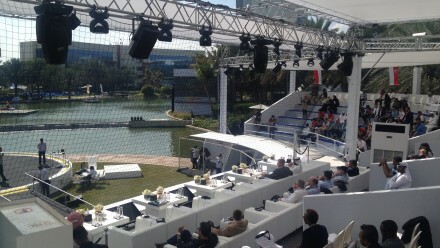 It could even be used so that the drone does only few flights altogether, and presenting an interactive film as the output. Susanne: So what’s the missing step from concept to realisation? Jussi: There are still a couple of things that we need to do. One is to enable a fully autonomous flight of the drone including take-off and safe landing, dealing with the batteries etc. Another issue we must resolve is the video image. During the recording, the flight is not completely stable, so we must do a lot of post-processing in order to stitch the 360° film together. This computer graphics part is not perfect yet, and we can make the video look a lot better than what it looks right now. 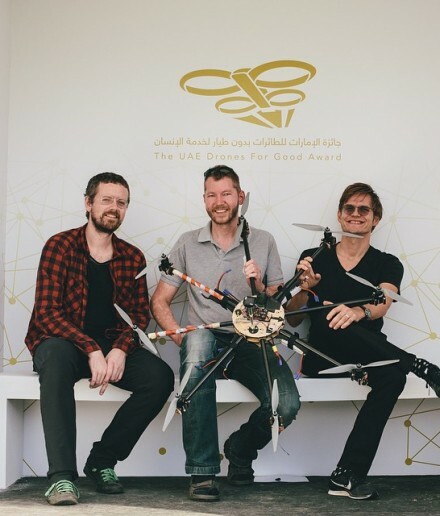 Susanne: What do you think about the UAE Drones for Good Award? What do you think did it achieve or will achieve in the future? Jussi: Since it was the first time that this award competition was organised, there was a crazy range of different kinds of concepts. Probably about 60 per cent were recycling the most common services you can imagine, for example using drones for disaster relief or logistics. Many felt like there was no real innovation in them. The ideas have been there, just not yet in the market. Due to the predefined categories you would have products by professional drone building companies next to DIY drone hacks by students with visionary ideas, which makes these categories a bit difficult to evaluate. But at the same time, the award marked a point in the field of enthusiasm for drones and it succeeded in bringing the people together, and the winning teams absolutely deserved the prize. Jussi is vice creative director at ART+COM Studios, professor at University of Arts (UdK), Berlin and visiting lecturer at IED programme at Royal College of Art (RCA), London.